One of the latest collections from M.A.C -- Semi Precious -- includes a product that hasn't left my side since I took it out of the package. I'm referring, of course, to the M.A.C Mineralize Charged Water -- the most recent addition to my prized collection of face mists. Since temperatures have skyrocketed in the past week, I've been looking for any way possible to bring a little refreshment and reprieve to my skincare routine. This mist most certainly does the trick! A few spritzes across my face and not only am I immediately revitalized and rejuvenated, but my skin looks absolutely incredible -- dewy, fresh and glowy beyond belief. And the scent of green tea and citrus? Zingy, clean and deliciously zesty. 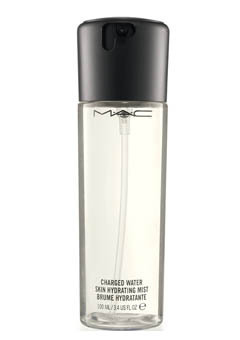 M.A.C Mineralize Charged Water retails for $22 at maccosmetics.com. That is a nice product I definitely have to check out and get for myself.